LeaderTask is a user-friendly task management app. Users of the program has already created more than 16 000 000 tasks! It is not an easy task to keep track of all your tasks and manage them efficiently. Faulty execution, not keeping track of schedule, and inefficient task management can all lead to disasters, like missing deadlines, not being able to complete a task, or even losing a job due to low performance. That is why task management softwares are commonly used around the globe. These can help you keep track of your schedule, prioritize tasks, increase productivity and efficiency, and improve teamwork. There are many applications available that fall in this category, each of them with their own benefits. LeaderTask is a task management software application, that can help you manage and schedule your tasks to increase efficiency and productivity at work. It let’s you plan your appointments, meetings and briefings, manage your tasks, as well as to store contacts and any other related information. It comes with a calendar and address book, alongwith some other great features. The installer size is ~18MB, and the installation process is simple and straightforward, taking no time at all to complete. The version provided her comes pre-activated and registered to be used. On start-up the application asks you register an account or login with an existing one. It takes a minute or two to register a new account, and start using it. A welcome window appears that helps you set up the application for first time use. You can select the type of project you are working on from the list, and then enter the task that needs to be completed today. Next it asks you to enter a task that you want to do on daily basis. After that the set up is complete and you can start using the application and explore the features it has to offer. The UI of the application has modern design, with a clean and well organized look. It is divided into three main sections. 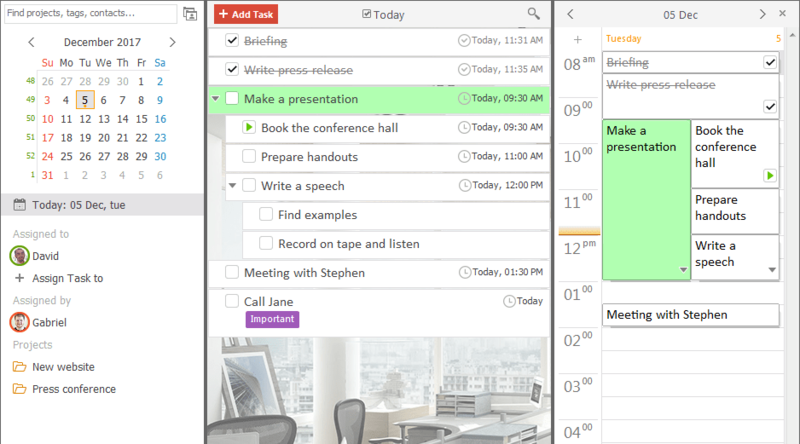 The section on the left contains calendar, tasks, projects, staff members, and some tools like email client, report, and more. The middle section is where you can see all your tasks and tick them once they are done. Tasks can be searched using the search bar and sorted by date, color, and creation time. The box to the left has a list with time markers, and you can drag and drop the tasks on different times throughout the day, week, or month. Settings menu can be accessed from the drop down menu at top left. You can also export/import projects, and backup data to open it later. – Clean, simple, and intuitive UI makes the application easy to use and understand. – Available on Windows PC, Mac OS, Android, and iOS devices. – Works offline, and all the data is synced across devices and team members on their devices. – Tasks are sent to other members using emails and they appear in their inbox on the application. – Attach files to tasks and notes: tables, documents, images and any other file types. – All the data is secured in Microsoft Azure cloud. – Comes with a calendar and allows you to store contacts. – Plan your days, weeks, months and years all in the form of a task tree. – Discussion toolbar works like an instant messenger and allows you to contact with your contacts easily. – Does not come with built-in journal, budget template or password manager. LeaderTask is a reliable application that can help you manage your tasks and projects with ease, while boosting your performance and productivity. The application comes with great features which are useful in one or the other way. It runs smoothly, without any lag or crashes. It is definitely recommended.